Some of you had wondered why I was waiting and while if it had been warmer this would have been accomplished a bit quicker I also wanted to make a special appearance at my dealer’s. I had talked with Dan Maxey at Maxey’s earlier in the week and said if the weather held I was going to finish out my 200k and would stop by the shop. With just that bit of information when I arrived at the shop, and I’ll admit I didn’t have it timed quite right, as I had to lap the parking lot 2 times but I actually hit the 200k there. They came out and started taking pictures. When I went inside I found they had been waiting for me. Tanya the parts manager had gone back as far as she could thru my tickets and tried to figure out how much I had done to the bike. She then etched this into the mirror along with the photo and had everyone at the shop sign it. When I get back from Daytona he’s having a party and I’m not sure what all to expect. He took probably 75-100 pictures today that I haven’t gotten yet, was talking about an article he was doing for the Yamaha Dealer’s newsletter and said he had a few other ideas he was working on. Wow! 200k? Trully amazing. I have ridden my 2010 FZ6R for 2 years and have 58k. I’ve been a bit worried about the life expectancy of the engine, but after reading about you and your FZ1 I feel confident that I can expect to enjoy my FZ6R for many more miles to come. Thanks for sharing. Ride safely! Sounds like you like to ride as much as I do. Keep on riding and with good maintenance and keeping it shiny side up you will get a lot of good miles from it. Hey bro, just curious if you still have your fz6r ? If so how many miles on it? I myself, have a 2011 fz6r raven and I’m closing in on 40,000 miles! Congratulations! I have the same bike, year and colour but less km on it. well done to you and the bike. my Fazer only got 30K on the clock but hope it goes as long as yours. any major work done to engine? Keep the shiny side up and keep on ridng it. You’ll get there. Yes the oil sensor is annoying but at least when it comes on I know I’m low but not serious. However I have gotten to the point I check it every morning when I’m riding and pretty much know if I’ve ridden 400-500 miles it will need about 3 ounces and I carry several 3 ounce bottles when I travel just for that reason. Was showing it off to the Yamaha reps here at the Daytona bike week and they took a few pics. Way to go Denise! Hope you make it to 300K! Hey JJ I’ve started on it but have a ways to go yet. Doesn’t sound like you get a lot of short rides in just long ones. I grew up in Milan, MO which is about 32 miles west of Kirksville. I went to my 1st 2 years of college in Kirsville. Have a good ride and enjoy. I love seeing my link or accomplishments show up on other forums. You are my reference! I’m, in Italy, one of the few to have made 165.000 km and when i saw your miles I told myself that my bike can live much longer! Congratulations! And I’ve started on the next 100k Have a long way to go but have put on 4500 of it so far. Got a new chain and sprocket today and heading for Arknasas this weekend to ride some twisties. Your doing fantastic on your and I’d be out riding all the time. I’m going to be in Northern Italy, Germany, Austria, Switzerland and Liechtenstein in August for 10 days. But won’t be riding a FZ1 but instead getting a Honda CBF 600. It will be my 3rd Edelweiss trip to this general area but I’m still looking forward to it. Keep on riding and let me know how your doing. I am tailgating you. My”biancona” is now at 150.000 miles and runs perfectly! However your fz1 is always our model. Aloha Denise! 165k miles for my BiancOna! In italy and Europe none have this mileage.Sound good! we are the best! Aloha Alessio you are catching up with me. I’m now just a bit over 228k and hate to say it not riding near as much. I managed 10k last year and hope to get closed to that this year but work has gotten in the way – sad to say. Girls that ride are the best girls in the world no matter what anyone says :). I would love to get back to Europe and ride again since it’s been 2 years but again not sure that will be in the cards. I’ve done it 3 times in 10 years and have had great roads and great company each time. For me, now, 184.000 miles (295.000 km)! And you? Over 230.000 miles? Great bikes for great bikers!!! Hey Ernie thanks for the compliment. 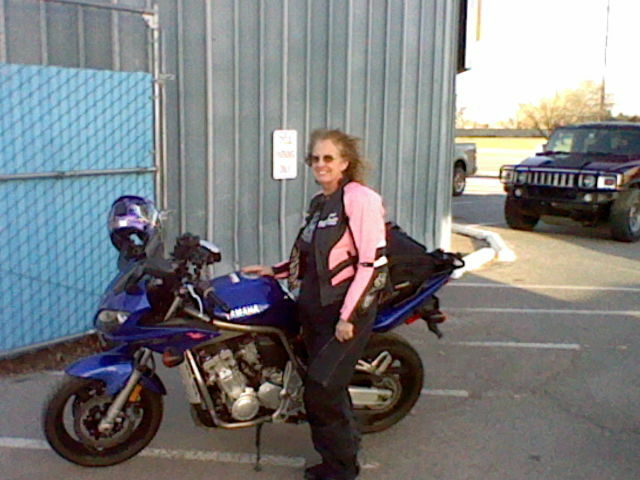 I know they have writtem me up in STAReview (MSTA – Motorcycle Sport Touring Association), Thunder Roads for Arkansas and Oklahoma, Cycle World had a small blurb about me being the reason for them doing a Bike Bandit Project bike and I responded to a letter in Sport Rider. Plus the local Daily Oklahoman did an article also. Did I miss one? I think the fame is going to my head. I’m at 206k and a bit now and just got back from a trip to Deal’s Gap. Really need to write up some articles for my blog but it’s been kind of crazy lately. I head for the Alps tomorrow but it won’t be on my trusty steed but over there don’t need that big of a bike. Take Care and keep on riding. amazing! I learned about you and your bike just yesterday. 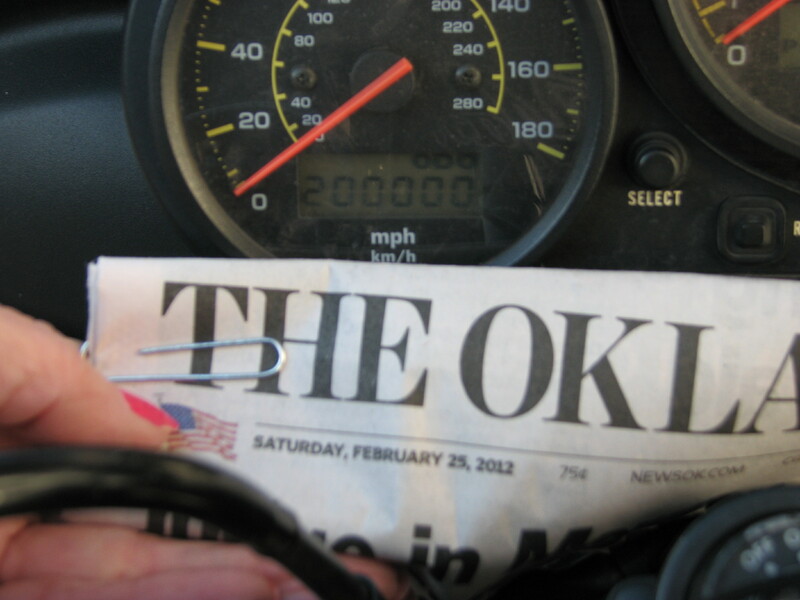 How many miles does your bike have now? I thought I replied to you but it may not have posted. I love my baby and she now has almost 212,000 miles on her. Was actually my lowest mileage year this past one as I just barely hit 10k. However I did get to come to Germany last August and put about 1600km on a ER6N which for the Alps was a great little bike. I sure didn’t need anything bigger in those awesome twisties. It was my 3rd trip in the past 10 years and while I’d like to ride other parts of the world I’d come back again if given the chance. I’m still happy with it lol just not getting to ride as much as I used to. I’m just over 220k now and only managed 2 very short rides in January. I’m ready for warm weather. Hi, I’m not riding quite as much as I would like to the last couple of years. Working too much. I have just over 220k on the bike now and looking forward to warm weather starting with Daytona. I have been following your progress for awhile. I finally broke down and bought a last year clearance 2013 FZ1. I am curious what mods if any you have done to aid your travels? Do you camp on your journeys? No I got out of the camping habit after several years of riding bicycles across Oklahoma. We at least had a support vehicle to haul stuff then. I actually camped 1 time shortly after getting my 750 Nighthawk and figured out really quickly that I carry too much stuff to pack it comfortably on a motorcycle. Plus campgrounds tend to have gravel and I’m not good with that. I do have a set of Cortech saddle bags with a tail pack that I use most of the time. Plus I also have a 5 Star rack that holds one of my Givi cases from the Nighthawk days. It’s nice when I know it’s going to be raining or when I want to be able to lock up stuff. As far as riding distances the important things are to have a saddle that you can stand for hours and hours and also a good windscreen that puts the air in the best position for you. Both of these are personal preferences because we are all different shapes, sizes and ages. After that a good throttle lock of some type is nice to allow for breaks of your right hand. I prefer the NEC Throttle lock over the Vista as it just again fits the reach of my thumb. Of course I wear all the gear and in the summer that may be vented but it keeps the sun off of me and I also carry water in a Camelbak if I’m not stopping a lot to hydrate. I just did my first oil change & I was wondering what oil & filters did you use to get such remarkable longevity? I used the ones from my dealer which were of course Yamaha and also Mobile 1 Synthetic. I do most of my oil changes unless the dealer has it in the shop for something else like tires about the same time. With synthetic you can go 5k between changes but I generally tried to do them between 4-5k. Plus I’m really good about checking the oil every time I ride. I think they are great engines when taken care of and probably don’t ride my baby as hard as probably most other’s do. How about a milage update. I’m somewhere over 229k right now and not looking like I’m going to get much more riding in this year. It’s going to be the lowest year yet and that’s just plain depressing. Hopefully next year will be better just have to see what happens. I realize my timing is a bit off. On a serious note chain maintenance on the road popped into my mind as I am getting my stuff together for my first long road trip. What chain lube do you use & how often do you apply it. In all your photos your bike chain appears quite clean. It’s never to late to say Happy New Year and it’s never to early to be thinking about the next road trip I’m headed for Daytona myself in just under 4 weeks and counting down the days. I will admit that this is one of the very few times that I actually truck it but then the friend I go with won’t ride down. So I truck part way to meet up and then trailer the rest of the way. 1st few years I did ride that 1st part and had a few snow storms to contend with though I was lucky enough to be in front of or behind them but had to take all my electrics and extra gear so this has been a bit nicer I just have to get it down to my dealer to load for me. My mechanic might disagree with you but you are right I’m very good about lubing my chain but he says I end up with a lot of it thrown off under the sprocket cover so he has to clean that up when he changes it. I’ve gotten a bit better about cleaning it with WD40 just to clean off some of the old stuff and I know that is all that some use but I don’t feel that is a lube just a cleaner. I’ve used 2 or 3 different types and for me I like the ones that spray on white I guess partly so that I can tell when I’ve got it completely sprayed but the one I’m currently using is Bel-Ray Super Clean Chain Lube and comes in both large and small cans. I always carry the small can in on of my side pockets of my tail pack along with mu little bottles of extra oil. If I’m riding in the rain I’ll lube it every day but if it’s just normal riding I lube it about every 500 miles generally. I also lube it from the inside not the outside so that it will work it’s way thru the chain and not just fall off. I try to remember to lube it the night before or at least before breakfast so that it has a bit of time to set or work it’s way in and not immediately get flung off. It’s a nice day today and so I”m going to go take advantage of a rare 70 degree Feb. day. Take care. Those are a few of the reasons I still have my FZ1. Other than location of oil filter and you are right about that being in a hard to reach location but doable. Mine gets about 45-50mpg and can go 225-250. Corbin saddle took care of the stock seat. At 239k now and still going. sono a 120.000 km spero arrivare ai vostri traguardi !! Any updates? Still riding? Change bikes? My 2001 FZ1 has 61k on it and still going strong. Glad to see these bikes hold up to some miles. I keep saying I’m going to update this blog with bits from the last 50k but life has gotten in the way of both that and the riding anything much over 10k per year. Colorado Springs coming up in June for a few days and have already done a couple of Arkansas weekends. I ride when I can. Hi Denise, I’m 500 short of 100,000 on my 04, and was looking to see where your at on your bike. I don’t see you’ve had to change the stator all those miles, that’s what most worry’s me on mine,( had troubles on a different FZ1). Any way just wanted to say Hi and see how your bikes doing. Nope my stator has never been changed. I know a lot have had that issue too. Only issue I have is that it burns a little oil. Still about 1 ounce per hundred miles unless I’m droning at 75-85 for several hours straight and then it’s a bit more but nothing really outrageous considering the mileage. I really need to find a way to retire and also someone to travel with so that I can ride more!!! I need to stop worrying about the stator. When living in Texas I averaged 30,000 miles a year on my FZ1s, now being in northern Minnesota not quite that much. I miss the 1st few years when I was averaging around 18-20k and got those first 200k in just over 10 years and I don’t have the excuse of moving too far north. I am amazed at this story, how cool. I have an 2002 FZ1 with 53,000 miles on it and I thought I was pushing the envelope. The shop told me at 39,000 that the valves did not need adjustment. Nice, this is not the story of my Italian bike owner friends. I also have an Italian bike > 2013 MV Agusta Brutale 1090RR. I will have to adjust the valves at 10,000 miles. Go Yamaha! 53,000 is just barely broke in This is one of the many things I love about this bike is the dependability of it and the distance between valve checks and adjustments. I ended this year with 263,431 miles which means I had 13,197 miles for this year. I’ve done a lot more in other years and a few years a bit less but I still love to get out and ride as much as possible. Have a save and Happy New Year. I’ll have to get over to Instagram and check it out. 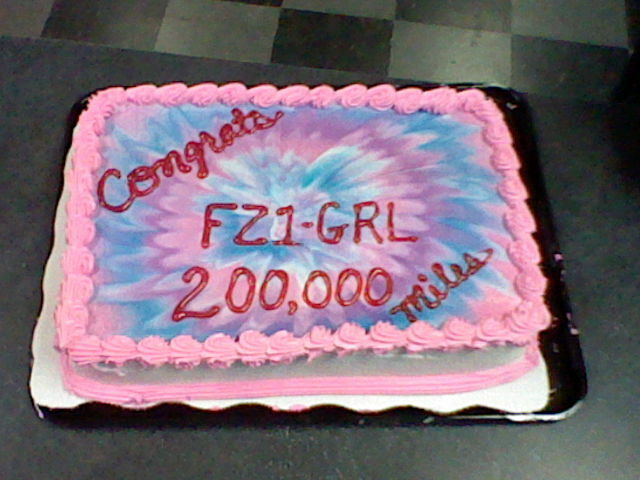 200k Party at Maxey’s Cycle…. 196k Another weekend another rally.